Braided silicone hose is suitable for ethylene glycol based coolant systems and meets SAE J20R3 Class A automotive standards. 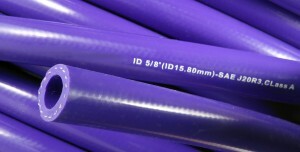 The hose features a textile braid reinforcement and silicone tube and cover. Silicone coolant hose is capable of long lasting service life under extreme temperatures and in oily environments. Hose diameters are available from 1/4″ ID through 1-1/4″ ID, long length spools available in most sizes. Also available in most sizes with spring wire helix for tight bend radius and vacuum capability. SAE J20R1 3 and 4 ply textile reinforced silicone straight hose, reducers, and elbows are available, as well as turbo sleeve connectors in a variety of diameters and lengths.